KXCD is one of my favorite comic websites that often relates to the scientific, sarcastic, and even human stupidity. It’s a great website, and it focuses on the social norms. What this KXCD pic made me want to repost to here, is due to the obviousness of the relation between a computer getting in fected with a virus and thus the effect was a broken computer, versus a person who’s blaming the problems with their computer by saying it was a virus. Normally 100% of the time this is the case. The purpose of a virus is to infect and open more potential doors. 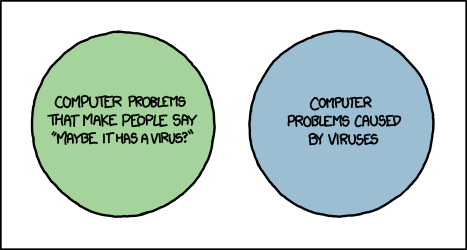 Heck a virus is a program that does its job very well. People could call a faulty/buggy application a virus, if the application causes a blue screen of death crash each time you reach a certain point.